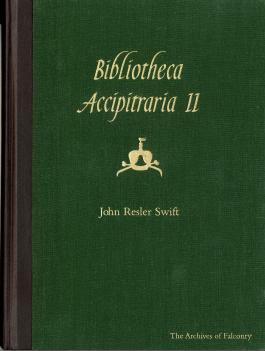 Bibliotheca Accipitraria II. A Catalogue of Books Ancient and Modern Relating to Falconry. Published in the English Language 1486 to 2000.
by John Resler Swift, Curator, The Archives of Falconry. Edited by William G.Mattox, Associate, The Archives of Falconry. Photography by James E.Hansen, Associate, The Archives of Falconry.